1 Events Media, the host of the annual E3 Business Awards, has announced that nominations for the 2018 event are now open. 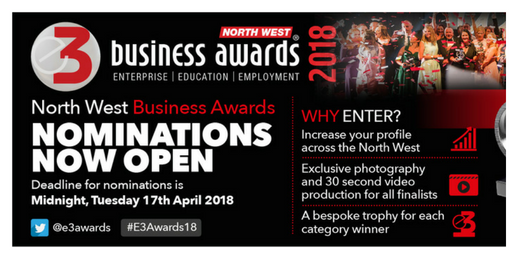 There will be eighteen award categories this year, and entries are encouraged from small and medium sized business, entrepreneurs, charities and social enterprises throughout the North West. The Awards ceremony will take place at the Macron Stadium in Bolton on Thursday 12th July 2018. The Awards are open to enterprises from every county in the region – from Cumbria in the north to Cheshire in the south. 2017 saw a record number of nominations and the hosts expect to attract even more this year. Entrants can nominate themselves or they can be nominated by others.